Package & Warranty : 24-month warranty and friendly customer service. Note: Please don’t place the item you are charging inside the pocket attached to the solar panel in order to avoid overheating then damage your devices. 1.Why you need this orange 28W solar charger? When we outdoor for camping, hiking, mountain and sports, we need to charge phone, camera or power bank, then this 28W solar charger suit. As the compact size and super lightweight, we design it tie to backpack no matter where we go. 2.How to use this solar panel charger? 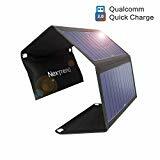 Charge your phone – Unfold solar charger under the sunshine and connect your phone with a USB cable, it work. Charge your powerbank – We could use it to charge the powerbank on sufficient sunlight, then do not need to worry about the rainy day when camping outside. Charge the camera battery – We could use it to charger camera standby battery and retain more beauty. – Easy to be folded to the size of magazine, can be put in your bag, as a portable direct power to carry. – 3 Port USB connector: two usb canle and one type c cable can charge phones and tablets at same time. – there is no built-in battery in this solar panel, so it can’t store power for use. Q:When charging, why does my iPhone show “Charging is not supported”? Q:Why did I put it on the ground/backpack during outdoor activity, but still I can’t get enough power?